"Thus says the Lord: Pass through, pass through the gates, prepare the way for the people; build up the highway, clear it of stones, raise up a standard over the nations..." (Isaiah 62). We laughed at the perfect timing! But also, how good it was to reflect on the way to heaven that Jesus paved for us by His Resurrection and Ascension! On this great feast, we reflect on the fact that Jesus took our human nature with Him to heaven! Think about that for a minute! Wow! "You descended from heaven to the earth, O Christ, and by Your Ascension You wondrously raised up the race of Adam which had been lying in the depths of the prisons of Hades. And having taken our nature back to heaven, You seated it with You on the Father's throne because of Your mercy and Your love for all" (Sessional Hymn). We hope that you'll have a smoother driving experience the next time you come to visit us! 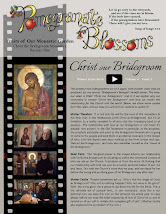 Join us for a day of outdoor and indoor work projects, prayer, food and fun at the monastery on Saturday, May 31. Volunteers of all ages and abilities are welcome! The day begins at 10 a.m., includes lunch, and closes with vespers at 5 p.m. followed by a cookout. Come at whatever time you are available, and bring a side dish to share if you can. 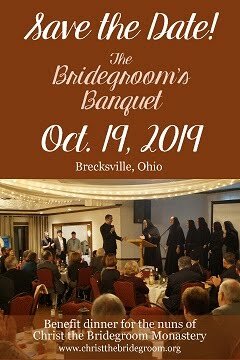 Please RSVP by Tuesday, May 27, to 440-834-0290 or christthebridegroom@gmail.com, so that the appropriate amount of food can be prepared. Please dress for the weather! 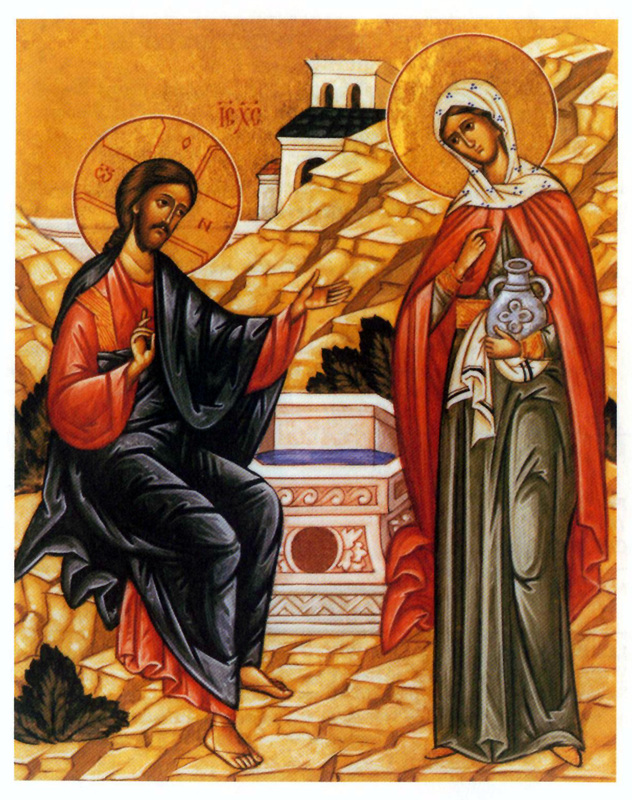 This reflection on the Sunday of the Samaritan Woman is an excerpt from a book we highly recommend (especially for those in the Byzantine tradition): "The Year of Grace of the Lord." "'Give Me to drink...'. The water that Jesus gives men to drink is the life of the soul carried to its highest potential. We all desire a certain intensity or fullness of life. But Jesus asks us to give Him something of our own life. He wants us to seek in Him that intensity to which we aspire. If to live is to love, He is thirsty for our human love. He is so close to us, and so humble, that He asks us to love Him--'Give me to drink...'. He will respond to our love, which is so poor, with love that is infinite: 'If you knew the gift of God, and who it is that says to you, Give Me to drink; you would have asked of Him, and He would have given you living water.' We seek to quench ourselves, to satisfy our thirst for love and intensity, our desire to live, by multiplying the objects we desire and that we possess. We run, gasping for breath, after sensations, after emotions, thoughts, beauty--and yet, ever and again, our thirst is unassuaged. 'Whoever drinks of this water will thirst again...'. But he to whom Jesus communicates His life stops being tortured by thirst--'shall never thirst'--and even finds, O miracle! that this water in him becomes a living source: 'The water that I shall give him shall be in him a well of water springing up into everlasting life.' Not only does he drink at the source, but he becomes a source for others." Girls' Camp Registration is Now Open! Teen girls! It's time to sign up for Girls' Camp! 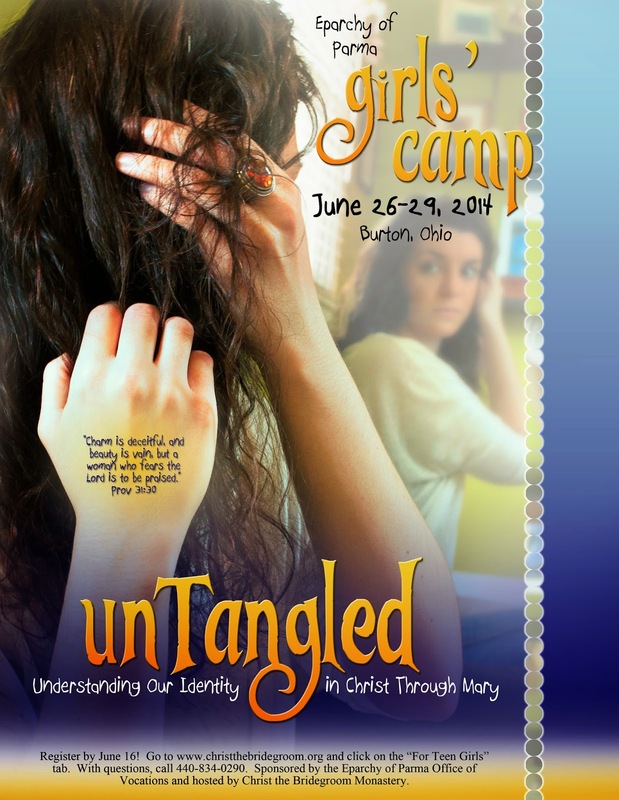 Our theme this year is "UnTangled: Understanding Our Identity in Christ Through Mary." Girls' Camp is open to girls 13-18. 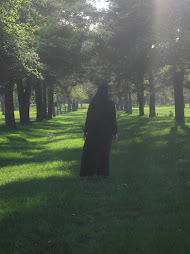 The camp takes place here on the monastery grounds and is led by us and other young adult women. The event is sponsored by the Eparchy of Parma Office of Vocations and provides an opportunity for teen girls to discover different vocations in the Church and develop a deeper relationship with Jesus Christ. For more information and to register, visit our Teen Girls' tab. Be sure to register by June 16! Space is limited! There is also a camp for boys 8-18, taking place at the same time across the street from us at the Shrine of Our Lady of Mariapoch. More information will be available soon at www.parma.org. We will close the camp at the Shrine with the boys and their families on Sunday, June 29, with a Hierarchical Divine Liturgy with Bishop John, followed by lunch. Watch our short Girls' Camp video below to see what we do at Girls' Camp! May 8 is best known in the Byzantine Church as the feast of St. John the Theologian, but did you know that it is also the feast of a saint often known as "the mother of saints?" 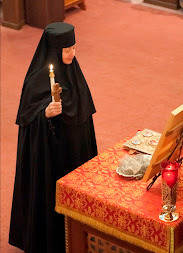 Her name is St. Emilia, and she is our dokimos (postulant) Jacqui's patron saint. 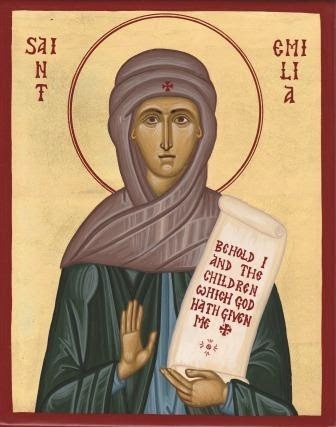 The Prologue of Ohrid states: "St. Emilia gave birth to nine children and inspired them with the Spirit of Christ to such an extent that five of them became Christian saints: Basil the Great; Gregory of Nyssa; Peter, Bishop of Sebaste; Macrina and Theosevia. In her old age Emilia established a convent where she lived with her daughter Macrina. There she reposed in the Lord on May 8, 375." We want to honor our mothers today, especially since we are close to Mother's Day, and thank them for all they have done and continue to do to inspire us to love God and to give our lives to Him! We ask St. Emilia to intercede for them, and we offer the witness of St. Emilia to all mothers. Perhaps she can become a good friend and intercessor for you as you seek to raise your children to love God. Even if your children are no longer under your roof, may she pray with you for their holiness and salvation! Perhaps they too will become saints through your prayers!